A class I recall of the SPOTCHEM II Basic PANEL-1 Reagent Test Strip and SPOTCHEM II Glucose Reagent Test Strip because they may report falsely low blood glucose levels. This potential inaccuracy poses a risk that clinicians would not diagnose hyperglycemia in a timely manner and might fail to treat elevated blood glucose levels. There have been no related reports of illness or injury. Elbasvir and grazoprevir (Zepatier) for the treatment of chronic hepatitis C virus (HCV) genotypes 1 and 4 in adult patients. The oral drug may be used with or without ribavirin. In clinical trials of 1,373 participants with chronic HCV genotype 1 or 4 with and without cirrhosis, 94% to 97% of genotype 1-infected patients and 97% to 100% of genotype 4-infected patients achieved sustained virologic response after 12 or 16 weeks on the drug, taken once daily with or without ribavirin. The most common side effects without ribavirin were fatigue, headache, and nausea. With ribavirin, the most common side effects were anemia and headache. The product carries a warning that elevations of liver enzymes to more than 5 times the upper limit of normal occurred in about 1% of clinical trial participants, generally at or after 8 weeks of treatment. 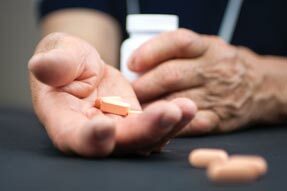 Patients with moderate or severe liver impairment should not take the drug. Eribulin mesylate (Halaven), a type of chemotherapy, for the treatment of unresectable or metastatic liposarcoma in patients who received prior chemotherapy containing an anthracycline drug. The orphan drug is the first to demonstrate an improvement in survival time in patients with liposarcoma. A clinical trial of 143 patients found that the median overall survival in patients taking the drug was 15.6 months, compared to 8.4 months for those taking dacarbazine, another chemotherapy drug. The most common side effects were fatigue, nausea, alopecia, constipation, peripheral neuropathy, abdominal pain, and pyrexia. 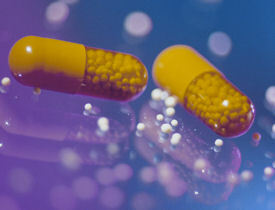 The drug may also cause neutropenia or decreased levels of potassium or calcium. Recombinant coagulation factor IX (Idelvion), an albumin fusion protein, to treat hemophilia B. To reduce the frequency of bleeding episodes, the intravenous drug may be used perioperatively, prophylactically, or as needed. Two trials involving 90 adult and pediatric patients ages 1 to 61 showed the drug to be effective at controlling bleeding episodes and managing perioperative bleeding. When used as prophylaxis, it led to a significant reduction in the rate of spontaneous bleeding episodes per year. No safety concerns were identified, and the most common side effect was headache. An action plan to reassess the FDA's approach to opioid medications. The agency plans to re-examine the risks and benefits of the drugs, convene an advisory committee before approving any new drug application for an opioid that lacks abuse-deterrent properties, and develop changes to immediate-release opioid labeling. It will also strengthen the requirements for drug companies to generate postmarket data regarding the long-term impact of using extended-release and long-acting opioids. Draft guidance outlining steps that medical device manufacturers should take to address cybersecurity risks. The guidance outlines FDA recommendations for monitoring, identifying, and addressing cybersecurity vulnerabilities in medical devices after they enter the market. Draft guidance on permanent, hysteroscopically implanted sterilization devices, such as Essure. Once finalized, this guidance will be included in product labeling to warn clinicians and patients of potential serious complications that can occur in some women, as well as provide a checklist to facilitate patient decision making. The FDA also requires the manufacturer of Essure to conduct a new postmarket surveillance study that will elucidate the risks associated with the product and compare them to that of laparoscopic tubal ligation. The study will evaluate how complications such as unplanned pregnancy, pelvic pain, other symptoms, and surgery to remove the device affect quality of life.